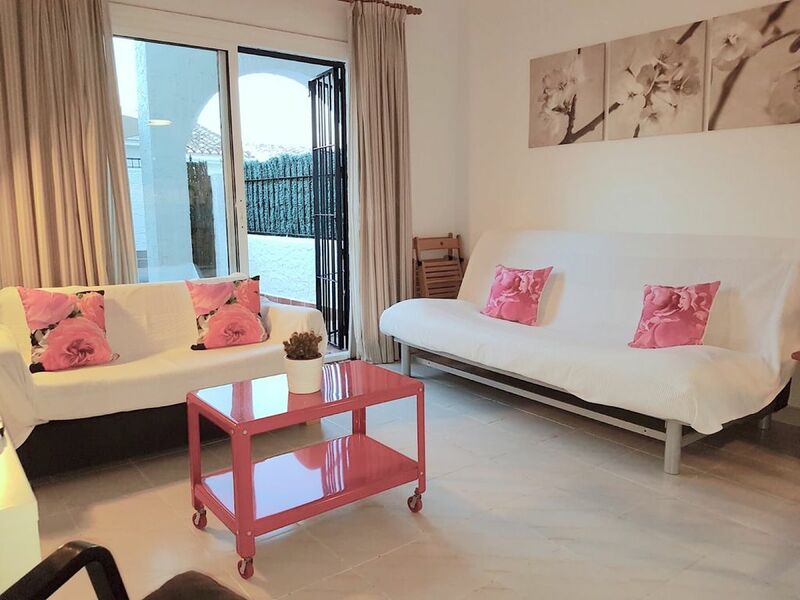 In the Carihuela, in a unique quality environment, clean, quiet, to enjoy relaxing. The urbanization is private with a certain charm, the community pool is salt water usually empty as the beach is so close, only 200 meters from Carihuela beach. The area has the best restaurants and bars on the Costa del Sol. (€ 1 = 3.5 hours, with pause mode) in all rooms. No car is needed, but parking is available (€ 40 per week). International TV channels (Foxnews, BBCWorld News, CNN, France 24, Football La Liga, Beyn ...). The beds and sofas are comfortable and of quality. There is a balcony in the main room from which you can see the sea. There is also a patio on the ground floor that is accessed from the living room. 100% cotton towels and sheets are provided. -The bus stop is just outside the entrance to the urbanization.Van to Malaga, Marbella, Torremolinos center, Fuengirola, Mijas, Benalmádena ... are frequent, and cheap. TIME OF DEPARTURE: 11:00 a.m.
-Politics without noise between 10 p.m and 10 a.m.
1 € coin operated AIRCONDITIONED & CENTRAL HEATING that last more than 2 hours. Enjoyed everything about our 3 week stay. Lovely property, exactly as described. A short walk to the shops & beach, and about 10 mins to the train station. Martha was very helpful and, on the day of my arrival, went out of her way to ensure that I actually arrived at the house! I will definitely stay at Martha's again should I visit La Carihuela. Marie, we were delighted to host you, and that you appreciated our offer. You are the perfect guest, and it would be a pleasure to welcome you whenever you wish to.Many thanks for staying with us. comfy, quiet, and well placed. had a lovely stay in this apartment, had to be good, because for two days we were kept in by the rain.! Besides that, the location is great for access to the beach/restaurants etc. The gated complex itself is very quiet, clean and well maintained. This is our second visit to this complex and certainly will consider a third . Martha was very accommodating in meeting us early with the keys, and we had no reason to call her back for any issue. Comfortable property in excellent location. Quiet but close to the front and centre of the village. Nice property in a secure and quiet development. Everything functional with a south facing outside terrace / patio area. Would definitely book it again! Thanks for your testimonial and staying with us. We liked our stay in Martha's house and she was very nice although she might answer short important questions more rapidly. The inventory needs improvement, including cutlery, which is not a difficult problem to take care of. We had some misunderstandings regarding parking space for our car but solved that with some extra payments. Bottom line we left the house with good feelings. Dear Jón, We strive to respond as soon as we can to requests. We would have greatly appreciated if you had told us about the cutlery while you were here as we are trying to figure out what the issue with the cutlery is, and we could have dealt with it straightaway. However, you prefered to keep it quiet and write it on the review. As per parking, it is clearly indicated on the ad that there is an extra charge for it, as it has to be hired from a neighbour. The Zoo,the Botanical Garden, the historic center and museums are in Malaga, just 20 minutes away. GOLF: ANDALUCIA IS NOW A WORLD CLASS DESTINATION FOR GOLF. Andalucia is a golfer's paradise and golf tourism is increasing by leaps and bounds. Others locally are: Guadalhorce, Lauro, Alhaurin,Torrequebrada. SKI: The Sierra Nevada ski resort is located at Pradollano in the Sierra Nevada mountains. This is Europe's most southerly ski resort and it is small in comparison to other European resorts.The facilities are considered top-rate and it has hosted numerous national and international ski and snowboard events. The Sierra Nevada ski resort has numerous runs of varying difficulties to satisfy all levels of skiers. Many skiers are pleasantly surprised to find that, because of its southerly position, the air temperature is usually warmer than other resorts.